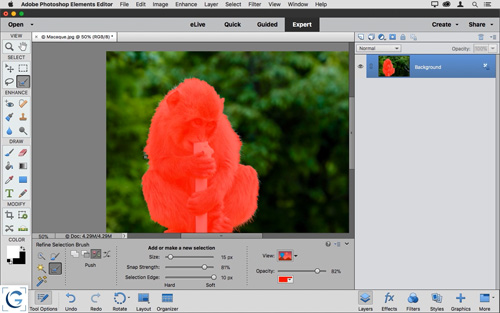 If you want to be able to exercise maximum control over your photos in Adobe Photoshop Elements, you need to master the use of selections and layer masks. That is exactly what this "Targeted Adjustments in Photoshop Elements" course will provide you with. You'll start by learning some of the key concepts related to the use of targeted adjustments, so you'll have a strong foundation on which to build your knowledge of targeted adjustments. Next, you'll learn about the many different ways you can create selections in Photoshop Elements, including tips on when each tool might be most helpful. Once you've learned about the tools and techniques involved in creating selections, you'll gain insights into the many ways you can refine your selections to improve their accuracy. Finally, you'll learn to harness the full power of targeted adjustments with a variety of lessons that will help you leverage selections, layer masks, and more, to apply adjustments to just the area of an image you want to affect. This comprehensive course will provide you with the knowledge and confidence you need to be able to apply adjustments to specific areas of your photos using a variety of different techniques in Adobe Photoshop Elements.